I am just warning you now that next week while I am on travel you are going to get warmed over San Francisco trip report as blog postings. This is a BIG LONG trip and I am pretty sure I won’t have the mental faculties to be posting. I am not sure I have the mental faculties to be posting right now for that matter, but I am. I get to be home for four glorious days before I am on the road again, did I say how keen I was on the month of January? 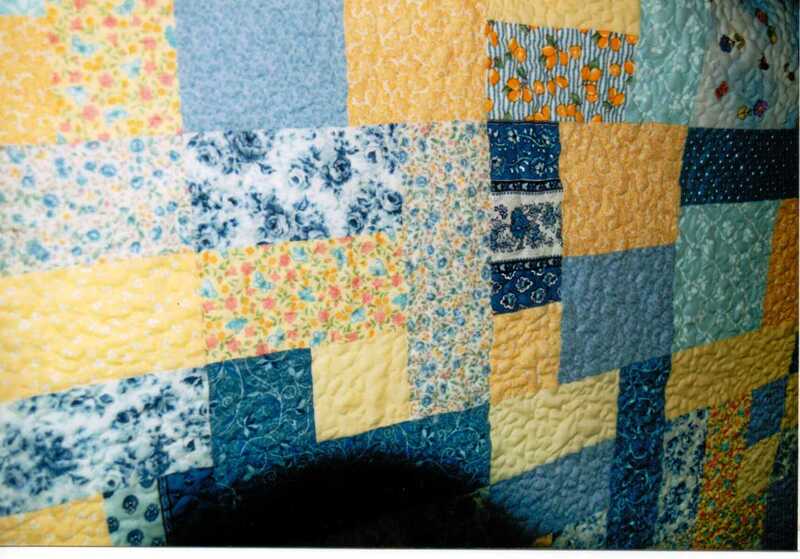 So for today, some more quilt history, this time with the quilts for grownups. The color on this photo is a little wonky, the blues and yellows aren’t usually quite this wild. 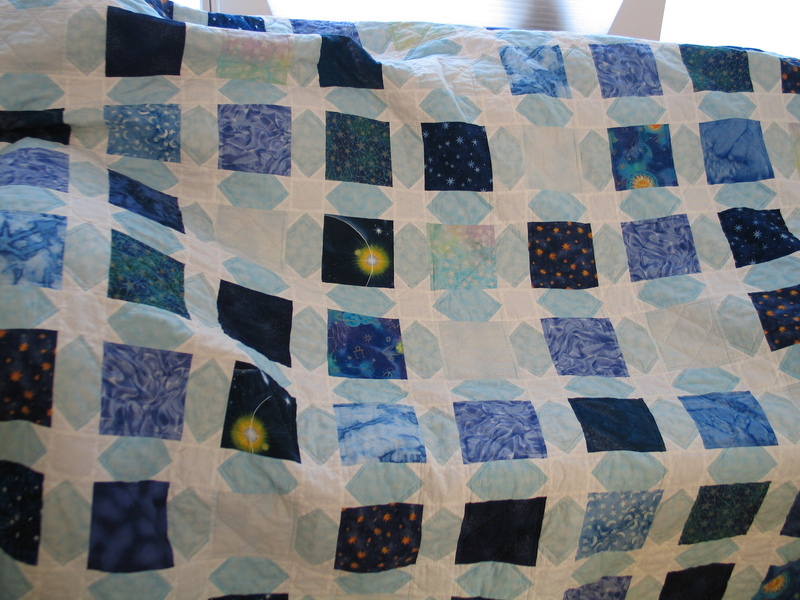 This was a quilt for my brother and sister in law for their 5th anniversary (Ken’s brother) – people were getting 5th anniversary quilts until they all started having kids and then I made quilts for the kids, and that slowed me down on the anniversary quilts. This shows the fabrics a little better, as well as a mysterious shadow. This pattern is called Yellow Brick Road. 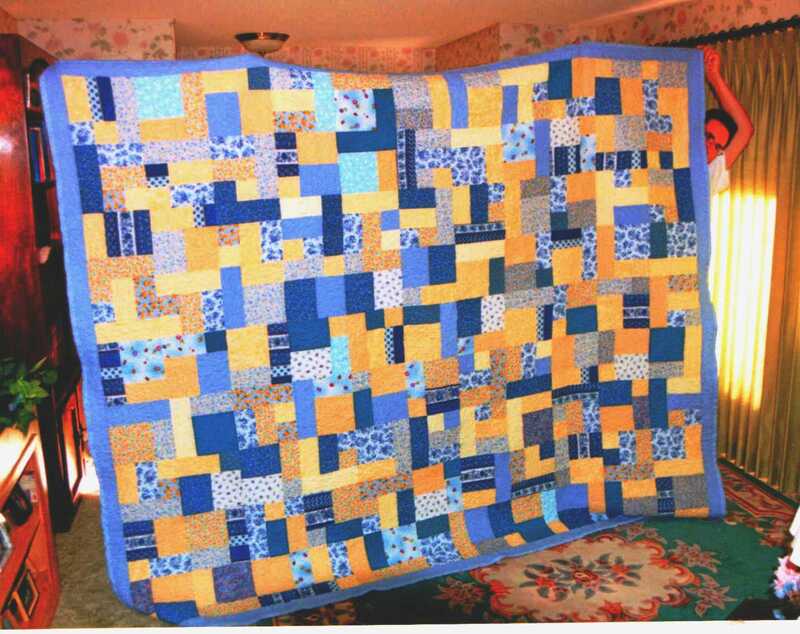 Garden twist quilt for another sister and brother in law (Ken’s youngest sister.) This one is called Garden Twist. Now that I look at it I may have done something funky with that pattern, it looks a little odd. I may have transposed some of those triangles. At least I was consistent. The colors are funny in the picture again, the background is actually a mottled black. 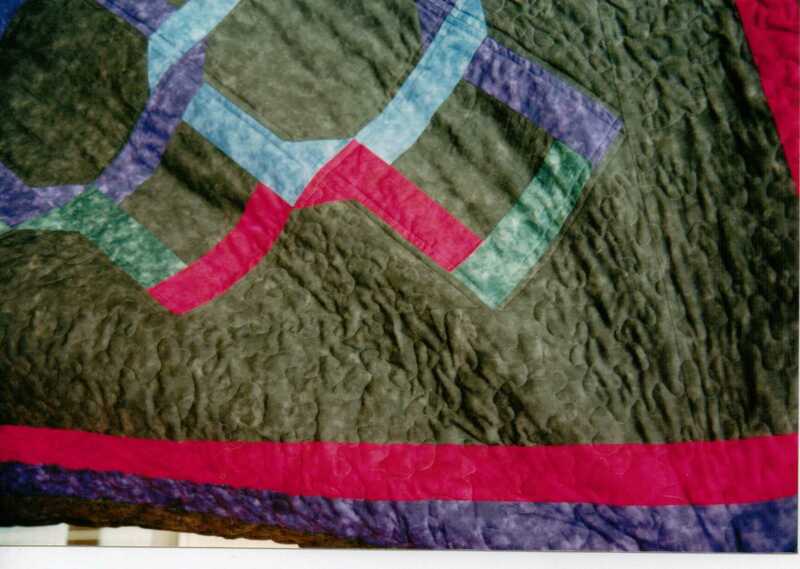 This quilt (finally, digital pictures) was made for Ken’s youngest brother and his wife as a wedding quilt. He is an astrophysisist, hence the “stars and galaxies” theme. 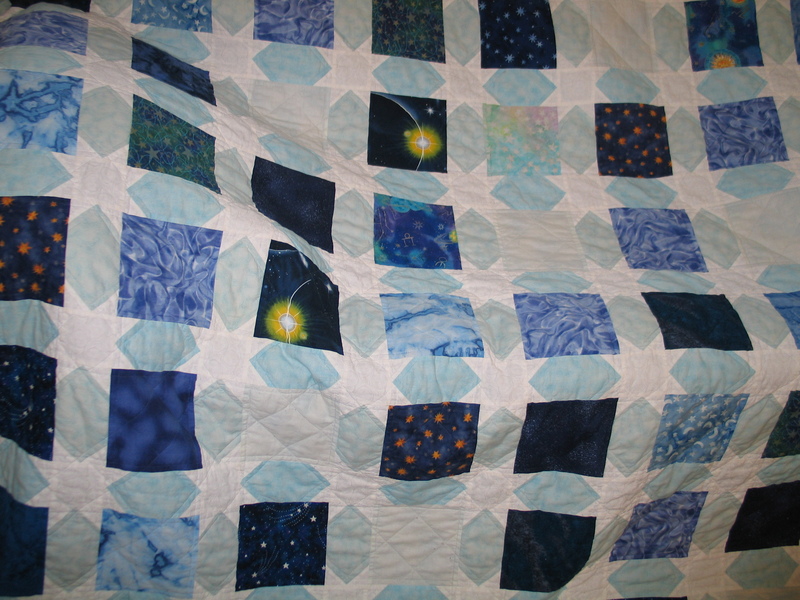 Now, of course there was a wedding quilt for the couple I made the 5 year anniversary quilt for, and a wedding quilt for MY brother and his wife, but I haven’t found those pre-digital pictures yet. 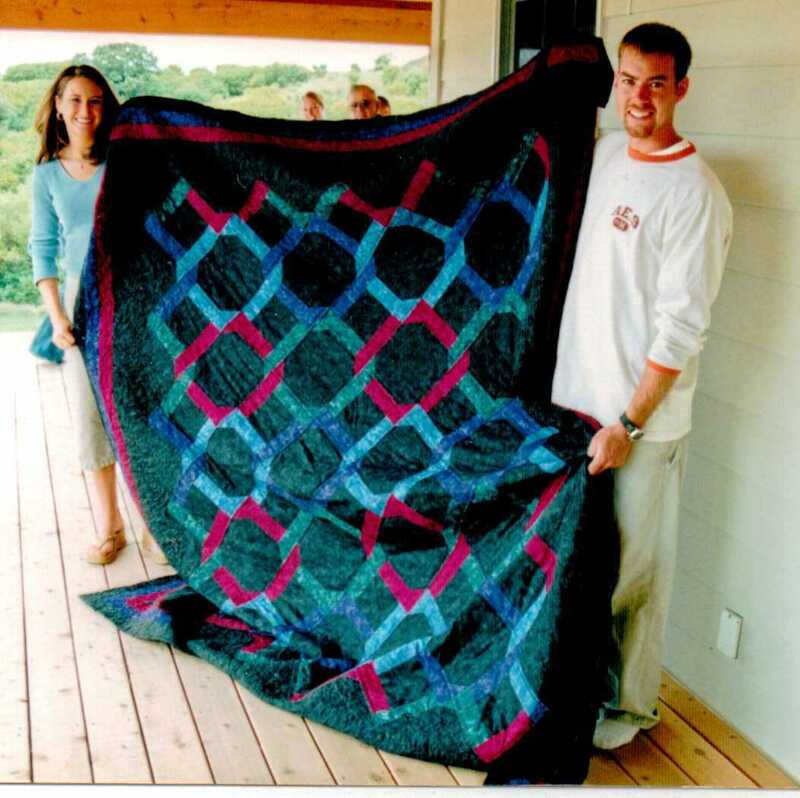 And the wedding quilt for my brother and his wife is a whole story in itself, titled something like “How NOT to make a quilt,” so it will get a post all its own when I find those pictures. And now I am going to hang out and enjoy being HOME!